Companies producing heat with power are the second most important coal consumers in Poland and the most numerous from all industrial coal users. 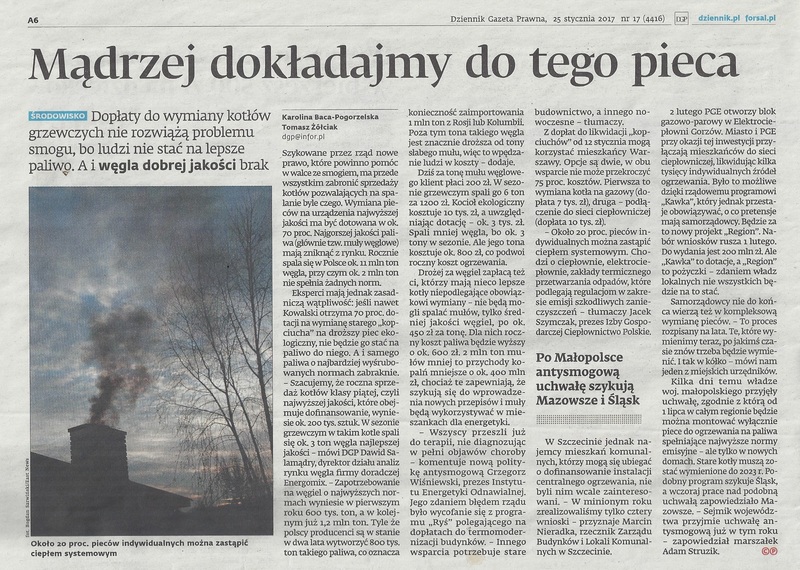 Around 50% of all Polish inhabitants buys heat from large heating companies. The rest of it is covered by individual sources or by rather small local facilities. Poland is one of European leaders considering district heating. In whole EU only four countries have biggest percentage of citizens using district heating: Latvia (64%), Denmark (61%), Lithuania (60%) and Estonia (53%). Iceland is the European phenomenon with its 99% of inhabitants connected to district heating. In general, European Union supports development of district heating because even though in Poland coal is the main fuel powering facilities, it is still much more clean and efficient than coal-fired household systems. Due to the historical events, today basically every large city in Poland has its own heat&power plant that provides majority of heat to the locals. The largest percentage of citizens connected to district heating is in Warsaw (76%), followed by Wrocław (62%), Kraków (61%), Łódź (60%), Gdańsk (58%) and Poznań (43%). Because of the technical and economical issues, heating markets have rather local character, limited usually to the area of a certain city. When it comes to the ownership structure, most of the Polish heat&power plants are owned by the municipalities (in 2010 51%, with rapidly increasing number of privatized entities). Although private-owned facilities are a minority, in all large Polish cities heat&power plants are operated by private or semi-private companies: in Warsaw by PGNiG Termika, in Kraków, Wrocław and Gdańsk by EDF, in Łódź by Dalkia and in Silesian region by CEZ and Tauron. In 2010, steam coal was powering 76% of all heat&power plants. Many experts were predicting decrease in coal consumption due to the development of biomass market and natural gas-powered turbines. Coal consumption indeed felt a little, but only because of the warmer winters in Poland. Meanwhile biomass market in Poland is struggling with insecure laws and gas is too expensive (many turbines installed in municipal heat&power plants have never been switched on). Heat&power sector is by average using coal of slightly better quality than the energy industry. Usually, the calorific value of ordered steam coal is in the range of 23,000-26,000 kJ/kg and with sulphur content lower than 0.8%, while energy industry is using coal of 20,000-23,000 kJ/kg and with sulphur content lower than 1%. Both these sectors use basically only coal of size 0-50 mm; 99.9% of total coal used in energy sector and 97.4% in heating industry is of that size. Table bellow shows coal consumption in the largest city-owned heat&power plants (coal consumption is measured seasonally: winter/spring). In power&heating industry contracts are usually signed annually for the seasonal deliveries. Specialists from the purchasing departments estimate the needs for coal for the following season and collect offers from the market. Since fuel purchases are under a category of so called “sector order”, they are exempted from the public tender procedures, but many companies follow these procedures for transparency issues. Tenders are usually set around spring and early summer. The source of deliveries is very diversified because of distance issues influencing prices: some companies buys it directly from the producers, some of them are supplied by domestic coal traders.